Born in Angeles City, Joon Claudio is a musician based in Paris, France. Joon is very elusive Filipino artist, and gave little details about his artistic inspirations as you can see when you Google search his name. This artwork titled “Bamboo” was given to Jason Macuha as a gift back in year 1998. 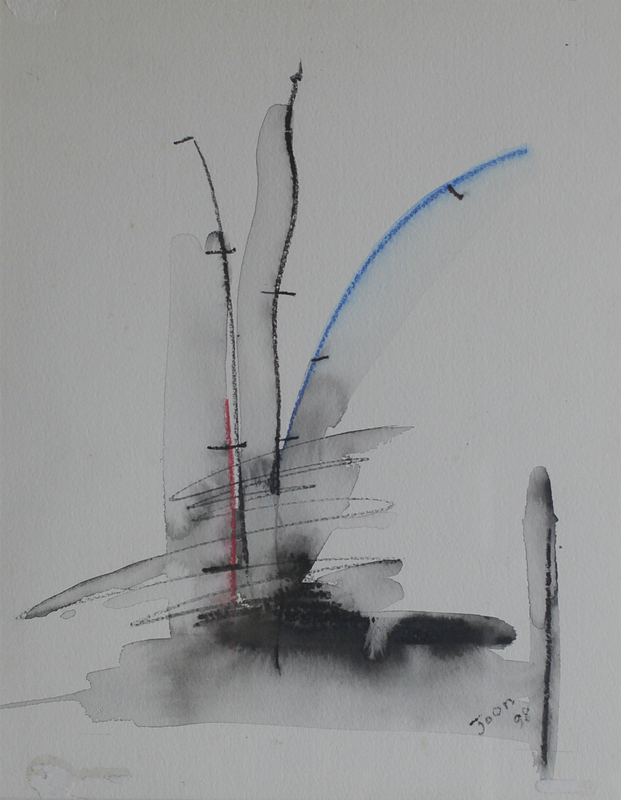 It is a very simple abstraction of a bamboo in watercolor on paper. The artist uses ink splash and wash method. Utilizing the fluid medium of watercolor and a grey palette, Joon Claudio fuses the forces of light, shadow, and texture to create his impressions of bamboo and nature. Among artist, bamboo is usually considered to be number one, the first thing to paint. Did you know that bamboo has great significance for many cultures especially the Chinese? It is a symbol for success, prosperity and protection from evil. If you choose to paint a certain number of stems, you may be interested in the symbolism of bamboo. Two stalks stand for a long marriage, three for wishing happiness, five for good health, six for harmony, and eight for prosperity. 1. Bamboo bends but never breaks. It symbolizes that we should always go with the flow. Adapt to the surroundings yet always stay firmly rooted. 2. Always be open and find wisdom in emptiness. Its symbolism is to empty our minds of prejudices, pride and fear; we can fill ourselves with new possibilities and new wisdom. 3. We should always commit to continuous growth. Whether you are seeing progress or setback, never stop growing. 4. Remain simple and straightforward. We should strive to live simply; it is the best path to authenticity and creativity. To summarize, the bamboo denotes community and holding together. Having firm roots to keep you safe as for the leaves and twigs, they speak of grace and fluidity of movement and intelligence and a well lived life.